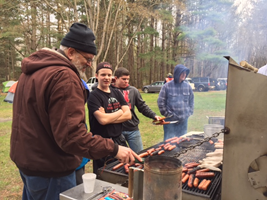 The Scouts and families of Troop 623 participated in the Adopt-A-Family program through the Salvation Army. 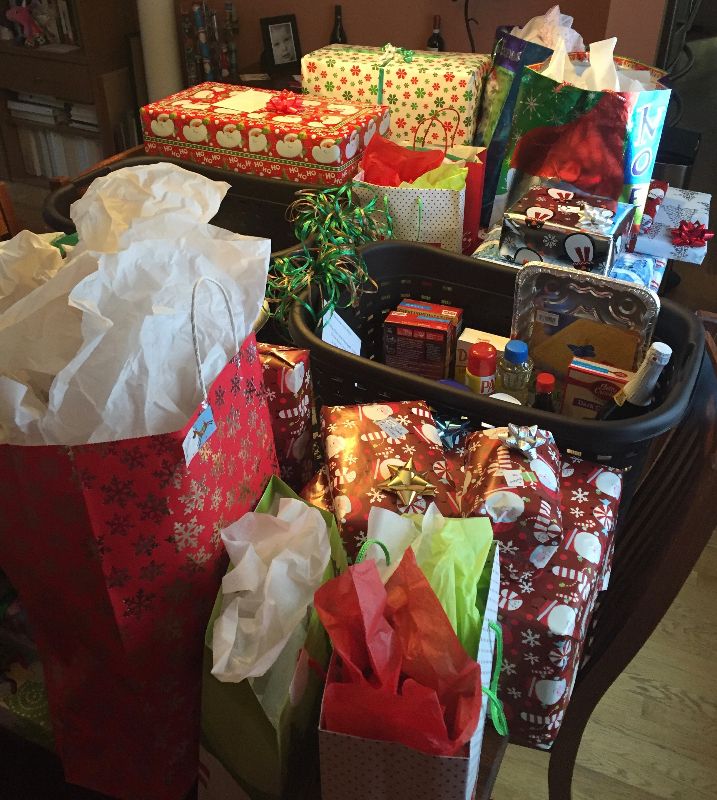 The Troop provided gifts and all the fixings for a Christmas dinner for two families! The Troop really rallied for this project and went above and beyond! 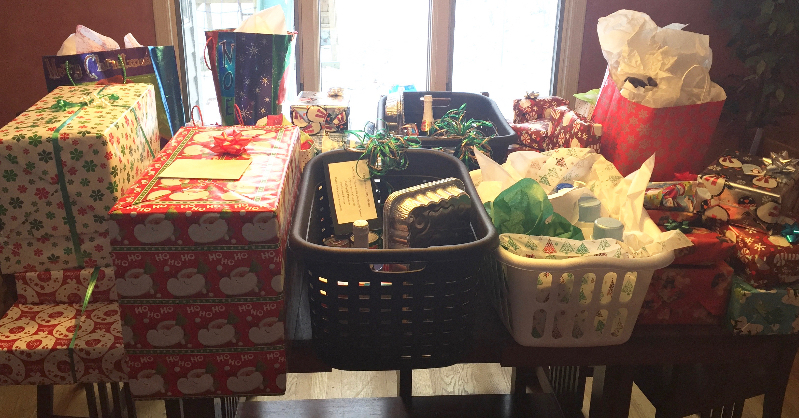 We were able to meet one of the families when we delivered the gifts and meal before Christmas- they were very thankful and said it was a blessing to receive the gifts from the Troop. The smiles on the kids’ faces were well worth the effort! We appreciate everyone’s generosity and help in making this a successful service project! 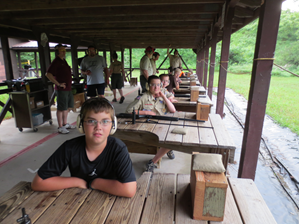 Look below to see some of the fun events that the Troop participated in. Attendance: 47 scouts and lots of parents! About this event: The Steelhead Ironman triathlon parking fundraiser was a smashing success! We parked hundreds of cars and raised over $7,500.00! That is about twice as much as we raised last year! This was due in part to raising our prices from $10 to $15 and we also had more space to park more cars. Our pre-orders for parking on Sunday sold out by mid-day on Saturday. 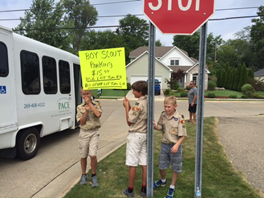 Six scouts stayed overnight to be ready to park cars at 4:00 AM on Sunday morning, the day of the race. It was a bit hectic, but we had lots of fun and the weather was great. About this event: NOAC is the National Order of the Arrow Conference. This takes place every three years. 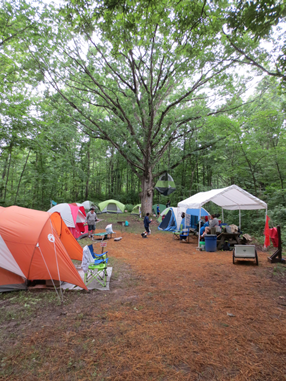 NOAC 2015 was at Michigan State University the first week of August. OA attendees can go to classes in conservation, leadership, ceremonies, and other OA related activities. 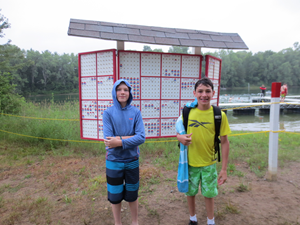 There are activities every night, including skits and speeches from different people. NOAC 2018 is scheduled to be held at Indiana University in Bloomington, Indiana. The 2015 Football Season marks a significant milestone for St. Joseph High School. The football program is much bigger than the players and coaches. It involves everyone from the drum major leading the marching band to the cheerleaders rallying the crowd to friends and families cheering on their team. It is all about building a heritage of teamwork, friendships, school spirit, dedication, determination and community involvement. All positive attributes that extend well beyond the football field and into the community. The 100th Season kick-off event was an Alumni Flag Football Game scheduled for Saturday, July 25th at 5 PM. Two beloved coaches are returning with clipboard and whistle in hand to direct a team of alumni players in a fun filled game of flag football. Coach Muhlenkamp lead the Bears from 1968 to 2001 and Coach Uzelac guided the team from 2006 to 2010. Both coaches had a huge impact not only on the players, but the community as a whole. The pre-game activities included an opening ceremony highlighting the community. The ceremony included members of Troop 623 raising the American, Michigan and St. Joseph flags. Followed by Lauren Kunkel singing the National Anthem and Congressional Awards presented by Congressman Upton and Senator Proos to the returning coaches and the St. Joseph High School Football Program. 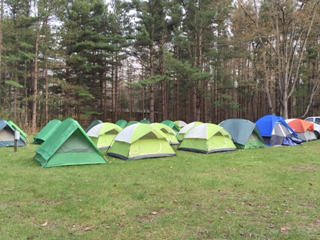 About this event: The troop camped overnight at Fort Custer State Park. 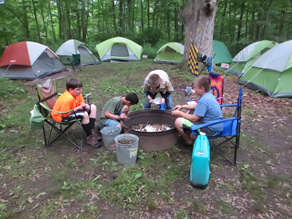 We set up camp and played games and made a camp fire. Then we got up early had a quick breakfast and left for the trail. 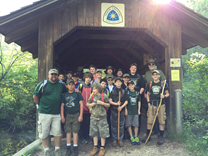 We hiked 10mi on the North Country Trail for the hiking merit badge and ate our trail mix we made at camp. We hiked this trail because it was part of the DNR’s dedication of the Iron Belle Trail- a 1,273-mile hiking route follows the North Country National Scenic Trail between Calhoun and Gogebic Counties. It traverses the west side of the Lower Peninsula, and borders Lake Superior in the Upper Peninsula. The DNR called all scouts, boys and girls, to help with the dedication by hiking a section of the trail. 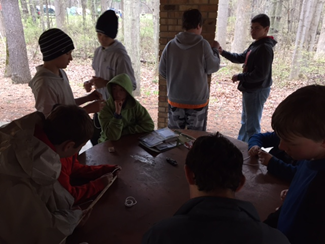 Troop 623 was giving a 10 mile section near Fort Custer in Battle Creek. 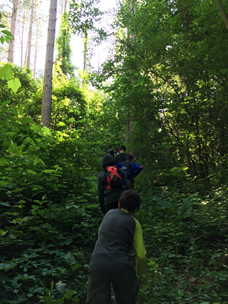 We hiked the 10 mile section and had lots of fun winding through wooded areas, fields, and even a large dairy farm. Click here for more information about the Iron Belle Trail. About this event: It was very cold and rainy but we had a great time. 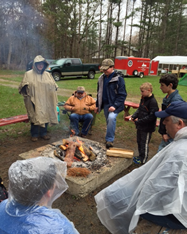 This was the first troop camping trip for some scouts new to the troop. We played capture the flag and slender-man in the field. 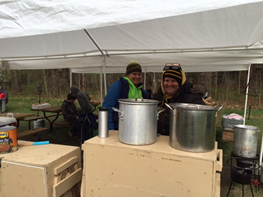 One memorable event was that the moms who were camping with us slept in the bathroom to keep a bit warmer! 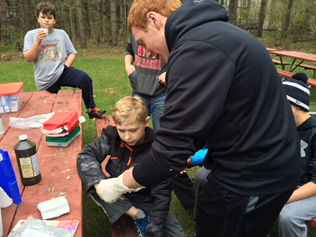 One of our scouts got good practice in first aid treating a cut finger- he did a great job!